We’ve been treated to quite a spring here in the California desert. After experiencing the greatest Joshua tree bloom on record this past April, one of our hardest-fought battles finally ended in victory last month—NPCA and our supporters have defeated the Eagle Mountain Landfill proposal once and for all. Joshua Tree National Park. Photo © David Lamfrom. Eagle Mountain would have been the largest landfill in the country, and proponents had proposed building it smack in the middle of a mountain range bordered on three sides by Joshua Tree National Park wilderness. At peak capacity, the facility would have accommodated 20,000 tons of garbage—per day—for 117 years. 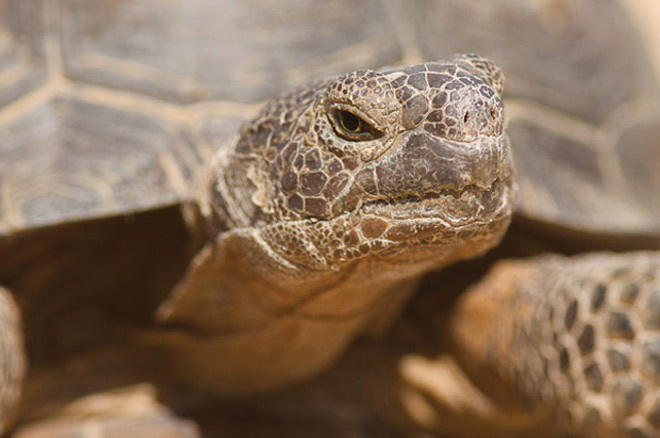 A projected map of the area showed that the landfill would have harmed 75 percent of the critical desert tortoise habitat within the park—one of the most important remaining refuges for this federally threatened species. On May 23, the Los Angeles County Sanitation District officially scrapped the project. They reported a list of reasons that read like NPCA’s own arguments against the landfill: a belief that people in the area were better served by more recycling and waste diversion, a desire to avoid environmental harm, and concern over the current need for the project, which was originally envisioned back in the 1980s. The endangered desert tortoise at Mojave National Park. Photo © David Lamfrom. NPCA worked on this issue for 15 years and challenged the legality of the project all the way to the Supreme Court. Even after landfill proponents lost the legal battle in 2011, they still attempted to find ways to amend the proposal and move ahead with the development anyway. More than 300,000 concerned citizens spoke against the landfill, through several proposal stages and presidential administrations. Former Interior Secretary Ken Salazar recently flew over the site and began work on a conservation solution for the region; Senator Dianne Feinstein shared a letter of concern against it; and the Desert Sun, the major newspaper in the region, wrote an editorial in favor of abandoning the landfill and adding the adjacent wilderness land back to the national park. We agree with the newspaper! This strong and persistent opposition has truly meant a better future for Joshua Tree National Park, adjacent wilderness lands, and critical wildlife habitat. This victory is especially significant for me on a personal level. Not only do I love to backpack, camp, and recharge in this stunning and unique park, I also put together a book on the desert tortoise several years ago that collected student photography as a way to spread appreciation for this threatened animal and the importance of preserving its habitat. This decision will hopefully help many more students and their families enjoy the beauty of this slow and stately desert icon. Joshua Tree remains one of the most important refuges for this species. NPCA is glad that the officials in Los Angeles County finally made the right decision and are finding more responsible ways to manage Southern California’s waste—it’s a real win for everyone.